//Powerhouse Animation really enjoyed creating animated versions of Richard Thompson's syndicated comic strip, Cul de Sac. As with our other projects working with the fine folks at Ringtales, Powerhouse would receive notes and the original comic strip, then we would use Flash to create an animated version of the script that tried to be faithful to the original cartoon. 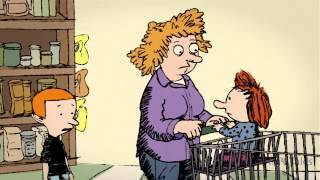 Richard Thompson’s Cul de Sac is a prime candidate for traditionally animated content. The whimsical world of Alice Otterloop and here trials and tribulations at pre-school and home make for some great cartoons.